Total Elevation Gain: 3,354 ft.
We were off fairly early this morning from our home base, around 7am or so. We made our way to the Mt. Princeton road. Somehow we got lost a bit heading for the road which is CR-322. We took CO162 from Nathrop and couldn't quite follow the signs or the GPS right to catch 322. The blue line leading into the image is where we came from. The GPS wanted us to follow the yellow route which took us into a no trespassing camp. We finally found our way to the green route which then brought us to CR-322 and the proper passage. You can click on the image posted for a closer look at what happened. 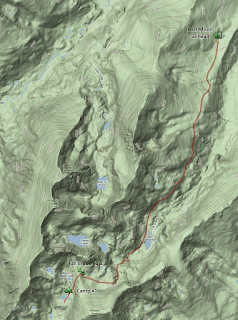 That image is from Google Maps Terrain view on the southeast slopes of Mt. Princeton. Once we were on the proper road we quickly ran into a Y-junction where the left route takes you into a private ranch and the right route takes you under a sign marked "Mt. Princeton" and into a large parking area. The road does continue on from this point with 4WD heavily recommended. We proceeded and drove up the narrow road with many water-eroded gullies in it. The rocks were very small in comparison to the South Colony Lakes road and the driving much nicer. This road took us up to around 11000 feet where we found some parking at the radio towers there. We'd heard that parking can fill up and be a problem on Princeton and we were fortunate to find a space, with the time being just before 8am. We were also surprised to find a few not quite full 4WD vehicles had also made it up there. From our parking space we started walking up the road. We passed some camping areas a few hundred feet up and from there proceeded up three or four switch backs. At about 11600 or so there is a large rock cairn and some rock steps leading up off the road and this is the beginning of the Princeton trail. From there the road leads on up the mountain to Lucky Mine. 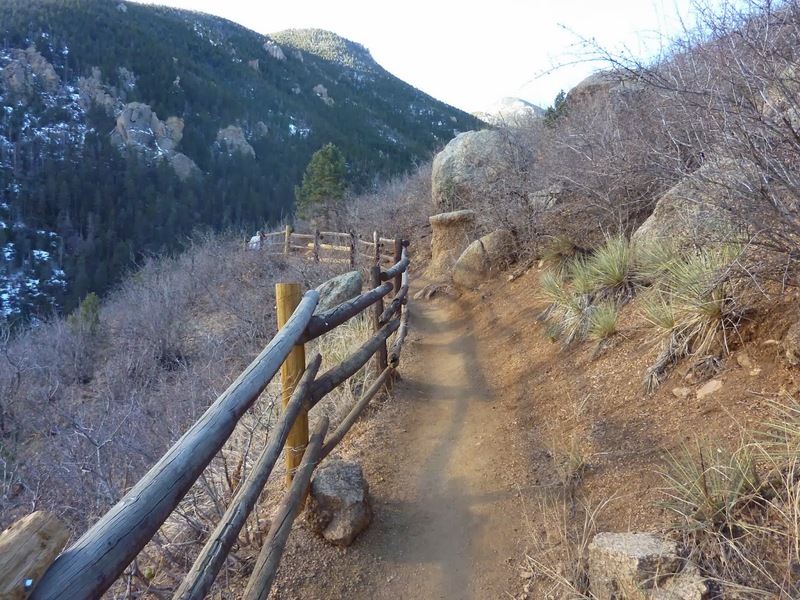 This early part of the trail is good and easy and it takes you around to the northeast side of the large 13er on Princeton's southeast ridge. The trail leads you to the north side of this 13er to where it eventually turns into a rock scramble. The trail is mostly easy to follow as it traverses the rock gullies on the north side of the 13er. Eventually the trail takes you to a steep climb up the slope to the saddle on the ridge. At this point its a climb along this upper ridge to Princeton's summit. It was still almost all rock from this point on and the closer we got to the summit the less of a clear trail we found. Climbing parties were taking several different routes to gain the summit. On the ascent we stayed very close to the ridge crest and did this to the summit. We found a plaque along the way for a woman killed in the 90's by lightning on Princeton. We finally summited at 11am. We took some great pictures from the top and enjoyed some food. There were quite a few people on the summit (almost 20?) and we likely met almost 50 along the way. On the way down we really cruised. Our ascent was in about 3 hrs 10 mins and the descent was 2 hrs 20 mins. We started to get good and quick at hopping from one rock to the next and moving through the boulders. The only problem we had on the descent is we really got cooked by the sun, especially while walking the long hike on the road out to the car at 11000 feet. We made it though and the suntan lotion worked. We drove the road out from Princeton with no event and headed back into Buena Vista. There we'd used the GPS to search out some lunch options and found a Mexican buffet. This sounded good and we headed there only to find it was a hole-in-the-wall Mexican American place called Pancho's with a large menu (which was nice) but no buffet. We had a good lunch there of tacos, nachos, and various items. I have two GPX track files from this hike. One is for the ascent route and the other is for the descent route. The two routes should be mostly identical. I have included in them in a KML file for download.